The event, entitled “No Unite the Right 2 – DC”, was scheduled as a counter-protest to a fascist demonstration called for August 12 by the organizers of last year’s Nazi rally in Charlottesville, Virginia, during which a right-wing extremist murdered counter-protestor Heather Heyer. As Facebook censors this and so much else, meanwhile, eg, the Dutch Nederlandse Volks-Unie neonazis are free to spout their praise of Adolf Hitler, racism, sexism, marches promoting that, etc. on their Facebook page. So, according to Facebook, the NVU nazis are not ‘inauthentic’ at all and welcome; like Holocaust deniers from all countries are welcome at Facebook. A number of activists and organizers in the Washington, DC area are disputing Facebook’s decision to remove a counter-protest event for a rally organized by Jason Kessler, the white nationalist figure who planned the deadly 2017 rally in Charlottesville, Virginia: here. While Facebook shuts down left-wing pages, groups and events with growing regularity, this latest action is particularly significant both because of its prominence—a major demonstration likely to draw large numbers of participants—and because Facebook has publicly boasted about it. The closure of the event page was a centerpiece of a blog post published Tuesday by Facebook outlining its efforts to crack down on groups aiming to “sow division using social media” ahead of the 2018 election. In addition to shutting down the rally’s event page, Facebook announced that it had shut down 32 other pages, including those opposing police violence and defending immigrant rights. The announcement was framed as a follow-up to the company’s announcement in September 2017 that “Russia-linked” Facebook pages bought some $100,000 in ads related to “divisive social issues”. In addition to serving as a pretext for major new censorship measures by Facebook, the 2017 announcement was connected to allegations by the Democratic Party that US President Trump “colluded” with the Russian government to win the 2016 election. However, with the Democrats’ anti-Russia campaign increasingly bogged down by the bitter factional battle in Washington, it appears that those sections of the state apparatus leading the drive to censor the Internet are hoping to decouple their efforts from allegations about Russian “meddling”. Facebook and its outgoing Chief Security Officer Alex Stamos explicitly declined to attribute the claims to the Russian government. “Today we’re shutting down 32 Pages and accounts engaged in coordinated inauthentic behavior without saying that a specific group or country is responsible”, Stamos wrote in a post accompanying its announcement. 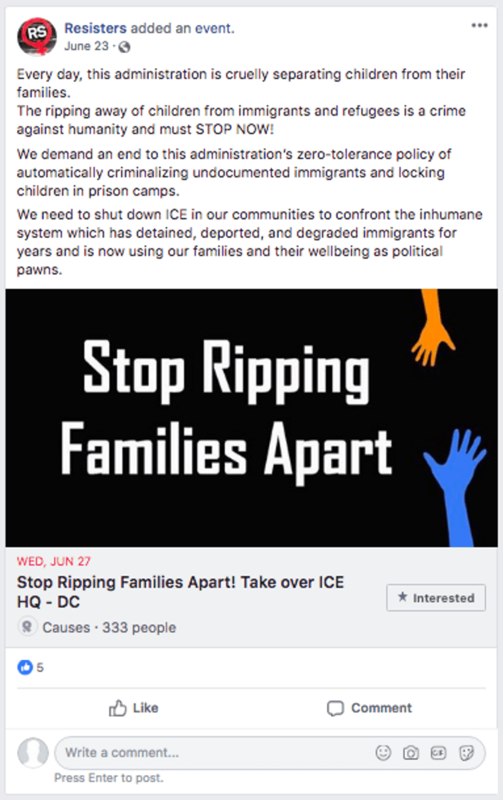 While the alleged “Russian” ads described by Facebook in 2017 included statements in support of both sides of the political spectrum, the latest batch of pages shut down were all left-wing, including those opposing police violence, attacks on immigrant rights, and the Trump administration’s right-wing policies. On Monday, the day before Facebook announced that it had shut down the page, the company turned its latest blacklist over to the Atlantic Council, a prominent military think-tank. Its analysis makes clear that Facebook is deliberately targeting left-wing groups. In another instance, the report characterized Internet content “focusing on the plight of Native Americans and modern immigrants” as promoting “anti-white” viewpoints. that Russia had anything to do with the pages. Facebook’s latest action must be taken as an urgent warning. Two years after the start of the campaign to censor the Internet in the guise of fighting “fake news” spread by “Russian trolls”, the social media giants, working with the US intelligence agencies, are increasingly making clear that their real target is left-wing political sentiment among growing sections of workers and young people. In so doing, they are following the path blazed by Google, which last year announced plans to censor “alternative” news, leading to a drop in search traffic to left-wing sites of up to 80 percent. With opposition growing among 260,000 UPS workers to a sellout contract being demanded by … their employer, a growing international strike movement among airline workers [see also here], and simmering anger among teachers and other sections of the working class in the US, the ruling class is concerned above all that workers will use the Internet not only to organize and coordinate their struggles, but to rally around a socialist perspective. Facebook Deleted The “No Unite The Right 2” Event — But Organizers Insist They’re Not Trolls: here. This [Haitian] asylum seeker is still waiting for his release from [United States] prison — three court decisions later. Speaking of imperialism, The Guardian covers a report from Global Media which describes Facebook’s Free Basics program as “digital colonialism.” “Facebook is not introducing people to open internet where you can learn, create and build things. It’s building this little web that turns the user into a mostly passive consumer of mostly western corporate content”, says Ellery Biddle, Global Voices’ advocacy director: here. As Facebook CEO Mark Zuckerberg travels around the US to “learn about people’s challenges”, one of his employees, living out a a garage, suggests maybe Zuck pay attention to inequalities in his own backyard. And Trump’s son, Eric, is accused of making anti-Semitic comments in reference to Bob Woodward’s new book about his father’s White House. This entry was posted in Human rights, Racism and anti-racism and tagged censorship, Facebook, nazis by petrel41. Bookmark the permalink.